YAVORIV, Ukraine -- Looking out and down from the inside of a Ukrainian Armed Forces Mil Mi-8 helicopter, I surveyed Ukraine as I have never done before -- marvelling at that country's measureless tracts of sunflowers and wheat fields nourished by the fertility of its chornozem soil -- understanding by seeing it from this height why this land, known from ancient Greek times as the "breadbasket of Europe," has again and again been made a ravin by the depredations of rapacious invaders. Presenting Col. Igor Slisarchuk with a copy of “A Canadian Hero” at IPSC, Yavoriv, Ukraine, on July 15. Lt.-Gen. Paul Wynnyk is at right. Since February 2014 the trespassers have been the Russians, whose army seized Crimea then attacked in eastern Ukraine, occupying much of the Donetsk and Luhansk oblasts (provinces). To this day they despoil there and so threaten the peace of Europe. But the Russians are encountering resistance, and an increasingly dogged one at that. From the very start of their unprovoked invasion of Ukrainian territory, they found themselves impeded by volunteers who rushed forward from all parts of their homeland to thwart the aggressor. The bravery and sacrifices of what we might well describe as Ukrainian "minutemen" helped blunt and then contain Moscow's imperialistic designs. And, since November 2014, Canada, stalwartly determined to help Ukraine remain sovereign, stable and secure, has been assisting in the enhancement of Ukraine's defensive capabilities. As part of a multinational joint commission, including the United States and United Kingdom, about 200 Canadian Forces specialists, currently drawn largely from the 3rd Canadian Division and deployed on six-month rotations, have been training Ukrainian troopers at the International Peacekeeping and Security Centre (IPSC) located near the hamlet of Starychi in Lviv oblast. Other Canadians are teaching at the Ukrainian Ministry of Defence's Demining Centre in Kamyanets-Podilsky. The IPSC is found within the Yavorivsky military polyhon, a 40,000-square-kilometre training area, the largest in all of Europe, created by the razing of 29 western Ukrainian villages at Stalin's command. My maternal grandmother's was one of them; her home once stood no more than a few dozen metres inside this restricted zone's front gates. As of July 1, the CF Joint Task Force-Ukraine had trained some 5,000 Ukrainian soldiers. Canada has pledged its support for Operation Unifier until at least March 2019. We may need to stay longer for Vladimir Putin, the KGB man in the Kremlin and "president-in-perpetuity" of the Russian Federation, certainly knows Russia can never be an empire without dominating Ukraine. Restoring an imperial Russian realm remains his fundamental goal, no matter how many of his soldiers' lives are squandered paying the butcher's bill. I was able to visit with our troops at the Demining Centre and the IPSC in a day, the mobility of a Mi-8 and the courteousness of Lt.-Gen. Paul Wynnyk, commander of the Canadian Army, and his accommodating staff, facilitating this sally. I learned more during this one summer's day than I do in most weeks. Let me also establish how it was agreed, well before we left, that I could write as I please, prohibited only from photographing individual soldiers or otherwise identifying them, a reasonable condition. I also travelled at my expense. And when I took leave of the general's party, it was clear that if I went further, up to the frontlines in eastern Ukraine, I would be doing so privately and entirely at my own risk. I did. Before I departed, however, my aim was to find out whether this Canadian mission was beneficial only in one direction -- presumably our side teaching as Ukrainians do all the learning -- or if there was more to it than just a paternalistic, one-way relationship. I got my answer at the Demining Centre. Quite by chance I overheard a conversation between the general and a Canadian officer who, when asked if he had learned from Ukraine's sappers, responded with an emphatic "Absolutely!" and then went on to describe how the "lessons learned" by Ukrainians engaged in the euphemistically named anti-terrorist operations (ATO) zone of Ukraine were being incorporated into the advanced training offered to military students. 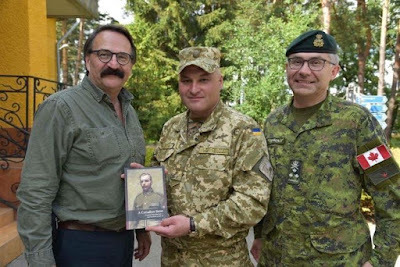 Canadian, British and American soldiers' lives will be saved in future because Ukrainian troops are bringing hard-won intelligence, paid for with their flesh and blood on the battlefield, and sharing it with their western friends. Later in the day I would, time and again, get positive responses from Canadian soldiers, including two graduates of the Royal Military College of Canada, whenever I asked if they were benefiting from this deployment. Indeed, most said they would like to stay longer, to learn even more. As for the Ukrainians, they have welcomed our troops as comrades in arms and, to a soldier, stressed how grateful they are to Canada for standing with them as they fight what has truly become Ukraine's war of independence. The Ukrainians, by the way, believe they will win it. From what I saw of their professionalism and pluck, not only in western Ukraine but on the eastern front, I think they're right. For do remember what Putin seems to have forgotten -- this is not the first time in their history that Ukrainians have fended off a foe.